Spiraling filaments suggest electric currents in space. Dust at a temperature near absolute zero shows up in the image above as a blue fog deep in the heart of the Eagle nebula. 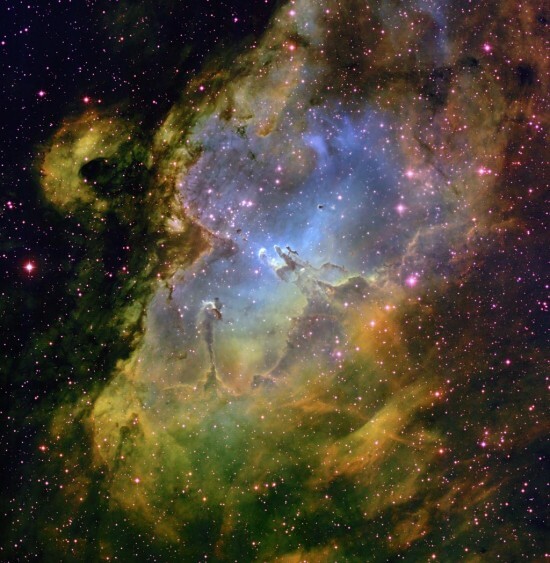 The Eagle nebula, located in the constellation Serpens approximately 7000 light-years away, is supposedly an active “star nursery”. It is a multi-spectral cloud of gas mixed with microscopic particles of dust. The consensus view is that cold dust is a necessary ingredient when stars condense out of a nebula. When gas and dust start to collapse into a new star it naturally warms up and radiates energy. As the theory states, outward pressure is created that opposes the inward force of gravity. If the outward force wins and overcomes the force of gravity, the atoms in the gas will never be compressed enough to undergo nuclear fusion. However, if the dust in the nebula is cold enough, it allows the heat created in the gravitational collapse to be radiated away, therefore a new star can ignite. On the other hand, when the Electric Universe theory is considered, cold nebulae are evidence of electrical activity even at temperatures near absolute zero. Bipolar symmetry is typical of most nebulae, and most of them are dense enough to emit light because they are extremely hot in some regions. The middle of the Eagle Nebula is cold: radio measurements indicate the dust clouds around the inner part are only one degree above absolute zero. The filamentary structure of the “fingers” and the way the filaments spiral away from the central stars indicates Birkeland currents, named after Kristian Birkeland, who first proposed their existence in the late 1800s. These currents form scalable tubes of plasma that can transmit electric power all around the galaxy. Electromagnetic forces sometimes cause them to pinch down to smaller and smaller sizes. Plasma confined within the center of the pinch is crushed and increases in current density until the so-called “z-pinch” produces a star. Plasma surrounding the star will often glow as an emission nebula, but in some conditions of opacity and density the surrounding plasma can be cold, as in the Eagle Nebula, revealing its presence only in infrared light. Conventional astronomers do no know how stars throw off clouds of gas and dust that eventually become other stars because stars are not made of gas and dust. A star is the focus of Birkeland currents that make up circuits flowing around the galaxy. The electromagnetic pinch that squeezes plasma into the star also forms a toroidal current around the star’s equator. The density of the current causes the plasma in the ring to glow. The Electric Universe explanation is that we are looking at plasma structures when we look at nebulae, and they behave according to the laws of electrical discharges and circuits. Instead of mechanical action and cold gas, the Eagle Nebula’s radiant new stars were created in a boost of electric current. It is not necessary to prevent young stars from heating up by shielding them in cold dust. The electrical sheath around a new star receives input from the galactic Birkeland currents in which it is immersed and gets pushed into the glow mode discharge state. Gravity has little if anything to do with the processes of star formation.